What is the turnkey solution ? The Turnkey solution is a formula where we take charge of your contest. From strategic recommendations (we can suggest a mechanism best suited to your objectives) to the game’s graphic charter (with your branding), we accompany you through the full setup and launch of your contest. We can then deliver your game in an agreed-upon timeframe. Enjoy a free one-month subscription to our Expert package while setting up and launching your campaign. Meanwhile, take control of your account and follow the results of your game in real time (all the benefits of a classic user are available in your account through your subscription). 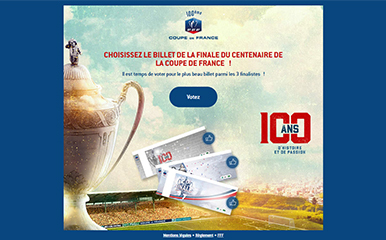 On the occasion of the final of the centenary of the Coupe de France, the FFF had initially proposed to users to submit a design for the ticket of the event. In a second step, thanks to the mechanics Fan's Choice Photo, the players were able to vote for the most beautiful ticket among the 3 finalists! 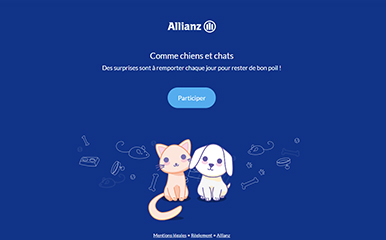 On the occasion of Christmas, Allianz launched an Instant Win Calendar "As a dog and a cat" to win Animalis gift cards. In addition to the initial offer you’ve subscribed to, our team can provide additional customized options. Don’t hesitate to contact us directly to discuss your project. Please contact us if you would like to evaluate the viability or provide a detailed brief of your project.